Nov 08, 2016 in "Mickey's Most Merriest Celebration"
An all new castle stage show, "Mickey's most Merriest Celebration," is now playing at the Magic Kingdom. 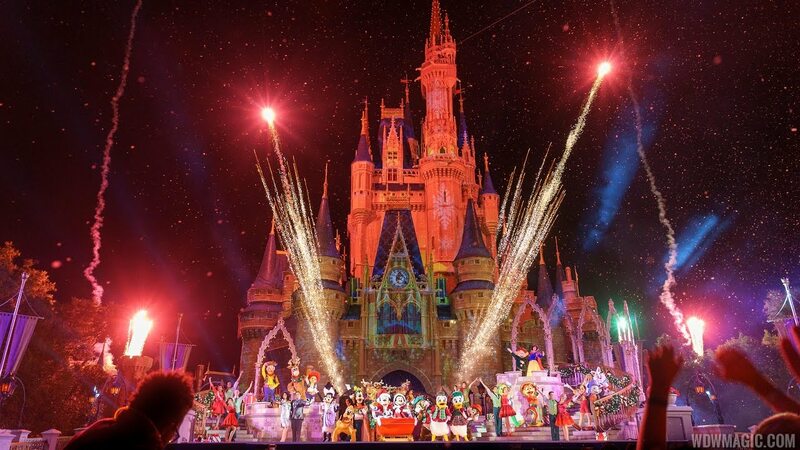 Part of "Mickey's Very Merry Christmas Party," the new show takes place on the Cinderella Castle Forecourt Stage on nights when Mickey’s Very Merry Christmas Party is offered, November 7 to December 22, 2016. In the new 20 minute show, Mickey and his pals invite some of their friends over for an unforgettable Christmas party filled with music, dancing, color and fun. Look for Woody and Jessie from “Toy Story,” Fantasyland friends such as Peter Pan and Snow White, and many more. Featuring medleys of holiday songs both classic and contemporary, along with special effects, castle projections and favorite Disney characters, "Mickey’s Most Merriest Celebration" is a modern update to the previous holidays Christmas show, "Celebrate the Season." Check out our multi-angle video from the opening night of "Mickey's Most Merriest Celebration," and our gallery for more photos.